Organic. A refreshing alternative to milk. With rice. Gluten and dairy-free. No added sugar. Without thickeners. Suitable for vegans. Vegetarian Society approved. Kosher - KLBD.Pure pleasure We'd like to take the credit for making this drink delicious, but the truth is that nature did all the work on this one. Its rich, sweet flavour comes from roasted Italian tondo gentile hazelnuts, the best in the world. Its silky texture comes from a little rice that we blend into the mountain spring water. It's as close as you can get to perfect hazelnuts in liquid form. How we like it Kidult breakfast: remember toast with that nutty chocolatey spread? 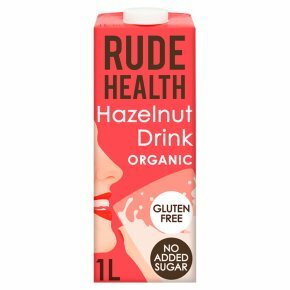 Relive those morning moments in a grown-up way with hazelnut drink on your cereal. Silk Squirrel Latte: froth some hazelnut drink and inhale those indulgent aromas. Guaranteed to make your tail fluffy. Nutty hot chocolate: nutty chocolate? Chocolate? Chocolate nuttiness? Who cares? You'll met.